Peppermint creme soft centered chocolates! As we have multiple food allergies in our family (gluten, dairy & peanuts), it can be rather difficult at Easter trying to find chocolates to cater for everyone. These soft centered chocolates are so simple to make. Take your time painting the chocolate mold to make sure there is a nice even coating. It’s also important not to overfill your chocolates with the filling. Please be patient and make sure your chocolates are set properly, otherwise when you try to remove them from the mold, they won’t come out without being damaged. 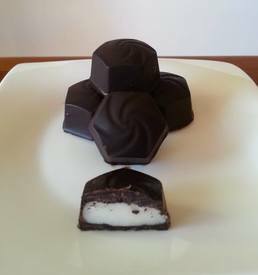 I love peppermint creams, especially encased in dark chocolate, but you can use whatever chocolate you prefer. These are extremely tasty and in my opinion they’re much nicer than anything you can buy from the shop.